The Scorpion 2 by Snugpak® is stalwart two-person base camp and expedition tent when a semi-permanent camp is required. The Scorpion design is a ‘Flysheet-first’ pitch tent that allows a quick and easy set-up in difficult and remote areas using an opposing pole design. This style gives great protection to you all year round from severe weather conditions. The Scorpion 2 is a true tried and tested favourite of mountaineers, climbers and campers. The tent has impressive floor space, creating ample room in the main compartment for two people in a top-toe sleeping arrangement and also creating a spacious front porch, perfect for storing all your equipment. In an emergency, the Scorpion 2 can accommodate up to six people sitting down. The Snugpak® Scorpion 2 is an easily pitched, angled profile tent with an extremely small packsize and a mere trail weight of around 2.24kg. Accompanied with DAC ® Aluminium Poles, it is designed not to take up valuable space and weight in your pack. When travelling on fast and light ventures, the tent design allows individuals to keep different components in each of their packs; this spreads the weight across more than one person. 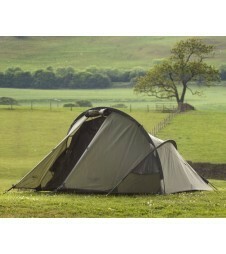 The Scorpion 2 is ideal for base camping and expedition use. A spacious two-person tent, the Scorpion 2 will shelter you from the worst four-season weather, with an impressive 5000mm hydrostatic head PU Coated Fly sheet, taped seams and a No-See-Um Mesh Mosquito Net, the Scorpion 2 will keep out the bugs in the summer months and the rain throughout the rest of the year. Condensation build-up is also at a minimum with the addition of multiple ventilation channels. The Scorpion design is the perfect green, allowing you to fly-pitch your tent with minimal environmental impact to the surrounding areas.